Kentucky is by far the best team in the nation, and the clear favorite to win the NCAA tournament, no matter what metric you look at. Still, even being the biggest favorite in history, KenPom, one of the premier college basketball ranking sites, gives them “just” a 34% chance of winning it all. So, the odds are that some team will beat Kentucky – but who will it be? Will it another one seed like Wisconsin or Villanova, or will it be some lower seeded team in a shocking upset? 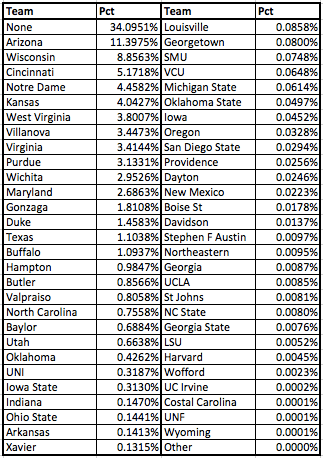 To figure this out, I used KenPom’s ratings and the log5 method to simulate the NCAA tournament 1,000,000 times. In those 1,000,000 simulations, Kentucky won it all just over 34% of the time. This number is slightly higher than the official KenPom number, which is to be expected as Hampton just knocked off Manhattan, and as they are the significantly lower rated team it made Kentucky’s path to the championship a tad easier. Below is a table showing the percentage of times Kentucky’s undefeated season ends at the hands of each team. As you can see, Kentucky goes undefeated, losing to no team about 34% of the time. Wisconsin and Arizona, the number one and number two seeds in the West region (the region who Kentucky would play first in the Final Four) top the list. After that, however, there are a few teams that are in Kentucky’s bracket, and therefore have a greater chance of facing Kentucky simply by the fact they would be playing them earlier on. Cincinnati is the unlucky 8 seed that got the draw to play Kentucky in the round of 32 (provided they beat Purdue), and then Kansas and Notre Dame are the two and three seeds respectively in Kentucky’s region. Which of these losses would Kentucky most like to avoid? Taking a look down the seven worst ways Kentucky could lose in the tournament, some are far more likely than others. Let’s break down these seven possibilities. Wisconsin: Wisconsin would love revenge for their defeat in the final four last year, and with Frank Kaminsky they have a player who could make that happen. A Kentucky-Wisconsin rematch, with Wisconsin coming out on top, a game many would love to see, has just under a 9% chance of occurring. Notre Dame: The three seed in Kentucky’s region, Notre Dame holds the distinction of ending UCLA’s 88-game winning streak. The chances of a loss to Notre Dame, as mentioned above, is around 4.5%. Indiana: A loss to Indiana, a repeat of their upset in 2011, happens only 0.14% of the time despite Indiana being in their region. Duke: The lowest ranked number one seed by KenPom, Duke, beats them in the finals only 1.5% of the time. This would still probably only be Duke’s second greatest win over Kentucky in the NCAA final. Louisville: It would be devastating for Kentucky to lose to Louisville, perhaps their greatest rival, but luckily (for Kentucky fans) it only happens 0.08% of the time. This would be sweet, sweet revenge for a Louisville team that got knocked out by Kentucky in both 2012 and 2014. Hampton: There is no great Kentucky-Hampton rivalry, but a loss to a 16 seed might be the most humiliating of outcomes for the Wildcats. Since this game is guaranteed to happen, the probability of Hampton being the team to stop Kentucky is just under 1%, making them the 18th most likely team to do so, despite being perhaps one of the worst teams in the field. And finally, in the 1 million simulations Harvard won the NCAA tournament by ending Kentucky’s previously undefeated season 53 times, so there’s only a slim 0.0053 percent chance that that happens. But what an outcome that would be. Kentucky would play the winner of the West region first (Wisconsin, Arizona, or ??? ), and wouldn’t face Villanova or Virginia until the Finals. Now, they should have set up the tournament as you wrote, as I think a Kentucky-Wisconsin or Arizona final would have been worth watching. Thanks for the catch, fixing that now. The Midwest region plays the West region in the Final Four first, not the East.